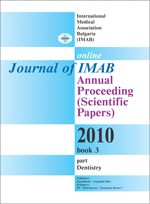 Polymerization shrinkage and related adverse effects are still considered a major problem of dental composites. To solve this problem different approaches are offered. Currently, 3M ESPE developed a new monomer system based on cationic ring opening, the goal is to create a composite material with low polymerization shrinкage called siloran. Aim: To investigate the clinical presentation of Filtek д Silorane Low Shrink Posterior Restorative for an observation period of 12 months. Material and methods: The study included 36 patients. Total of 66 restorations are made. They were evaluated using modified USPHS criteria of Ryge and Cvar. After their assessment, restorations were captured with a digital camera and X-rays were taken in parallel technique. On control examination after one year, 31 patients (63 restorations) were available for the study. Same parameters were assessed and new digital pictures and X-rays were made. The statistics was made with software SPSS version 17. For statistical analysis a Criterion Pirson (x2) was used. Key words: Filtek Silorane, clinical study, composite, class two.